Throwing a fabulous party does not have to be a costly affair- with a bit of imagination it is easy to put together a thrifty and terribly chic party. I love to host a pizza party, with the guest making their own small pizza and serving ice cream sundaes for dessert. This meal is like a nostalgic trip down memory lane for many and is just plain fun for all! I first got this idea from the book, Essentially Lilly, and it is always a roaring success. For the dough, go to your local pizzeria and purchase enough dough for eight small pizzas. I always buy my dough this way and the end result is much tastier than frozen or prepared alternatives. Divide into eight individual balls and using a rolling pin, flatten into a pie shape. Bake for 10 minutes at 400 degrees, top then bake another 10 minutes. Place the toppings of your choice in small colorful bowls and allow guests to make their own personal pizza. Some of my recommendations for toppings are as follows but be creative and use whatever you and your guests like. Sauce: I suggest buying a jar of Mariana sauce (I like Newman's Own) for use as pizza sauce. Pesto and a bottle of olive oil are good to have out as well. Cheeses: Fresh mozzarella, feta crumbles, Parmesan and Gorgonzola. Toppings: Black olives, sliced tomatoes, mushrooms, spinach, caramelized onions, roasted garlic, peppers, pineapple, arugula,fresh basil, fresh oregano. Meat: Pepperoni, prosciutto, sausage crumbles. 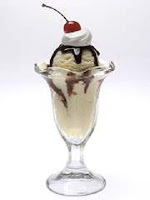 Desert: Vanilla bean ice cream with chocolate syrup and a cherry on top. Serve in pretty glass bowls and watch your guests smile as they indulge in this classic treat. 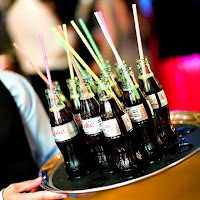 Drink: Serve coke and diet coke bottles with bright straws and mini water bottles. Place them on a serving tray, as pictured. If you feel like spending a bit more and the occasion calls for it- grab some inexpensive but good house red. Decor: Use fresh and seasonal flowers, this will always keep the costs low. If you have a garden, pick whatever is blooming and place in small vases. For instance, my sunflowers and Gerber Daises are blooming and I would use bud vases with a single bloom for decoration. Music: Look to the Rat Pack- a mix of Frank Sinatra, Sammy Davis Jr. would be great. Sign up for Pandora, if you haven't already, and listen to this music for free on your computer. Dress: Wear something casual and comfortable. These dresses shown are available at http://www.edressme.com/, under $150.00 and are sure to make you one frugal fashionista. I would pair them with gold Jack Rogers or any other gold sandal with funky jewelry for an easy and fabulous look. Entertaining should always be fun and easy. A party such as this one is just that and makes it easy to host a dinner party on a dime. Enjoy! This entry was posted on 9:23 AM and is filed under budget entertaining , entertaining tips , saturday soiree . You can follow any responses to this entry through the RSS 2.0 feed. You can leave a response, or trackback from your own site. Me too! Can I join the pizza party? What a great idea!! PS: do you have a wood-burning oven? What could be better than friends and a simple yet delightful meal. Good to get together and enjoy one another. A delicious blog! Thank you for your visit also. This is such a great idea for a party - 2 of my favorite things: pizza and ice cream! Thanks for the comments on my post! They were so nice! i miss drinking coke in bottles! So nice to hear that you liked my post! sounds like a great suggestion - I had never thought of buying pizza dough from my local pizza joint - good idea! Thank you for all of your comments, I love hearing your reactions. Hi, Lola! I would love to have a wood burning oven but sadly, I do not. Do you? I think that it would make a fabulous addition to any home! Now, this is my kind of meal! Love how you even give some fashion suggestions :) What a fab idea! Love your comment on your coffee table...thanks for playing. Come back soon and don't be a stranger! Thanks for stopping by my blog - everyone loves the lanterns!! Maybe you can post on ideas for finger food asian party - (include fashion tips too please!!!!) I'm going to have a 'do' in my backyard Bali Hut soon! Love your ideas - I'm going add myself to your 'following'. That sounds lovely! I love this idea! Your party and get together ideas as so much fun, I'd love to link to some if you didn't mind. Hi Dragonfly- good idea! I will be working on this soiree. I love that you have a Bali hut, how fabulous! Rachel, sure! That is no problem to link. Enjoy!